Refreshing, uplifting and invigorating, Sicilian bergamot is enriched with fragrant rosemary and precious woods in the purest wax candle, diffuser and room spray. Includes 4 votive candles, diffuser and room spray. 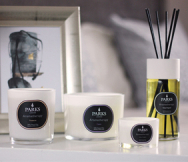 For more than 20 years, Parks London candles have been a byword the world over for purity and quality. Our clean-burning aromatherapy candles, room sprays and diffusers are made with generous amounts of precious essential oils for a true, long lasting fragrance to transform any home.